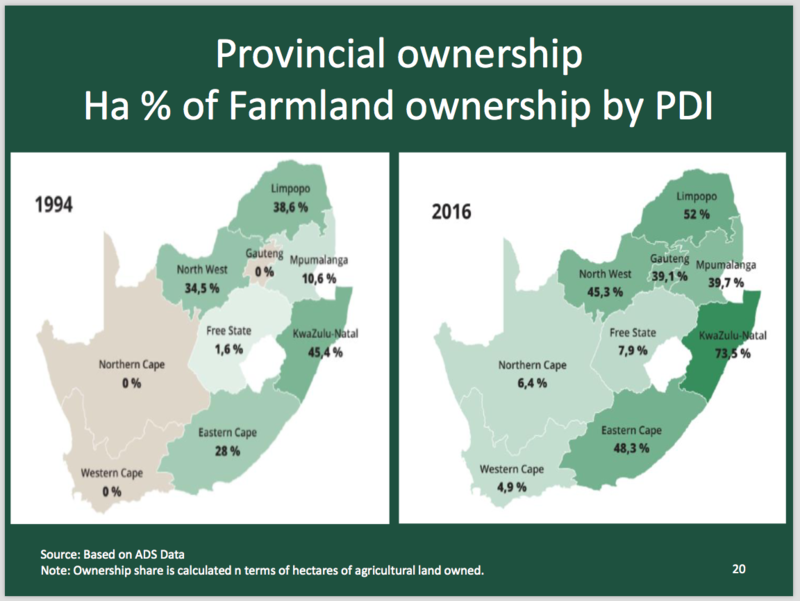 Obviously a sensitive and emotive topic, an appeal was made to remain objective by looking at the current laws and policies in place dealing with the issue of expropriation without compensation. Sandy spoke to members about a High Level Panel Report which was released by Government in November 2017, making detailed recommendations on all existing current land policies and laws, in which she specifically highlighted the Report’s finding on land. This High Level Panel Report also noted that though the Constitution currently provides for positive land rights in sections 25 (5), (6), (7) and (9), that these rights at present are not being adequately promoted, enforced or protected, and that instead they appear to be under attack from policies and practices directly benefiting specific elites within political alliances. 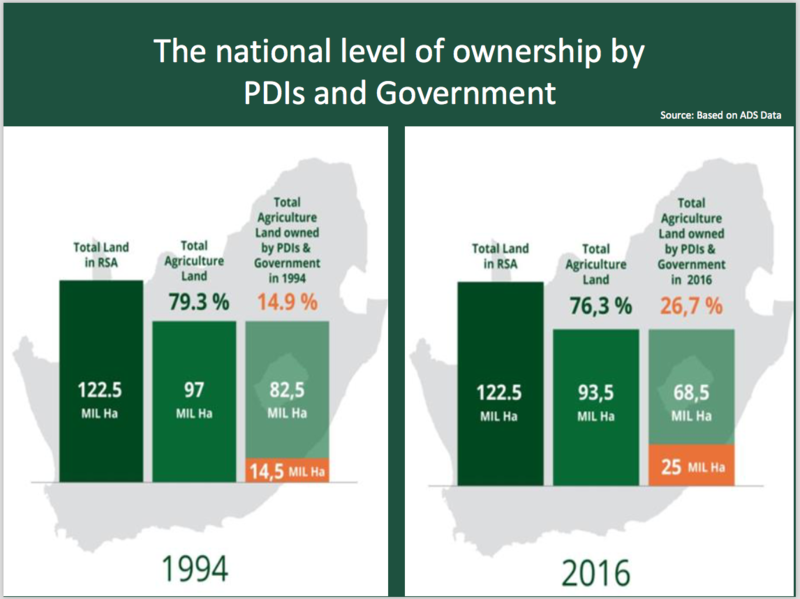 The declining pace of land reform and transfer of land into Previously Disadvantaged Individuals (PDIs) was also discussed at the meetings. 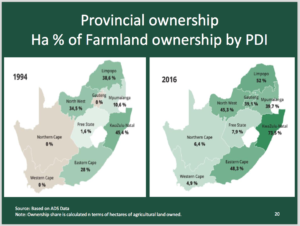 Sandy told members that according to the AgriSA Land Audit, currently Government and PDIs own more than half of all agricultural land in the three most fertile provinces – namely KZN, the Eastern Cape and Limpopo, giving them control of more than 46% of SA’s agricultural potential and that the lower levels of land transfer in the Western and Northern Cape were attributed to the lower land potential. 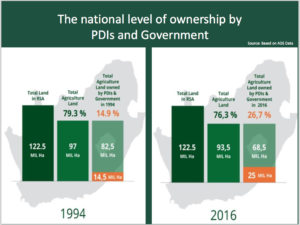 Two weeks prior to the District meetings, on 27 February, the National Assembly set in motion a process to amend the Constitution to allow for expropriation without compensation. This motion, which will involve a Public Participation Process, was then referred to the Constitutional Review Committee with a deadline of 30 August 2018. In the immediate wake of these developments, Sandy told members that it was still unclear as to what exactly the policy approach would look like, and what the implications thereof would be, as the ANC, government etc had not released any documents on the subject. She said that the current legal status, legal precedents and international practices do not allow for expropriation without compensation. She also reminded members that the Constitution can only be changed by Parliament in terms of section 74 of the Constitution which require a two-thirds majority and six of the nine provinces voting in favour and that a President cannot change the Constitution, nor can it be changed through a referendum. The importance of the role of organized agriculture comes to the fore, Sandy told members, when dialogues around this topic take place, Kwanalu and AgriSA will participate with sound legal, economic and social positions. Public Hearings as part of a public participation process, in order to obtain the views of affected stakeholders, are due to take place in KZN in seven District Municipalities between 6 and 8 June. We will be reminding members of these Public Hearings closer to the time but ask that you prioritize these dates now.